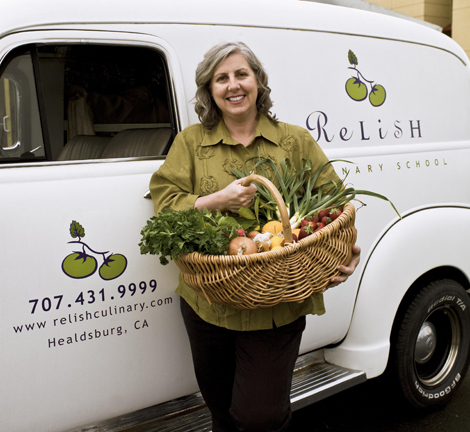 Healdsburg, California, in the heart of the Sonoma wine region, is home to the Relish Culinary Center, founded by Donna del Rey. 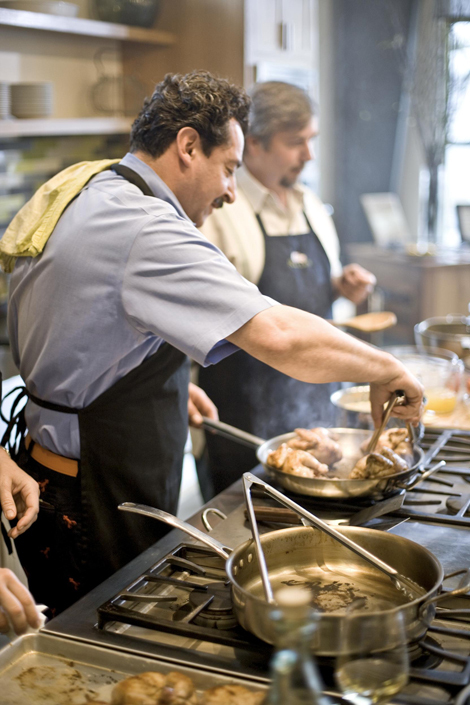 Instructors are local authors and chefs. 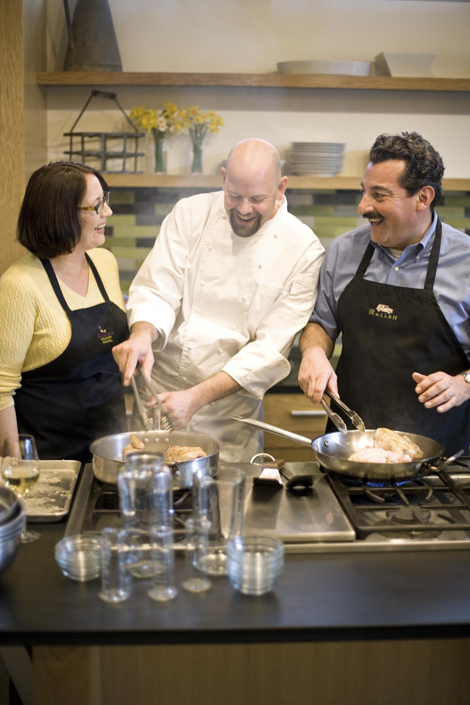 Here, Chef Christopher Greenwald shares the secret of pan-roasting locally raised poussin (young chicken) with students Kelli and Frank Toledo. Recipe for Pan-Roasted Poussin here. Turning the pousin so that it browns on all sides ensures a golden finish. Relish owner Donna del Rey. 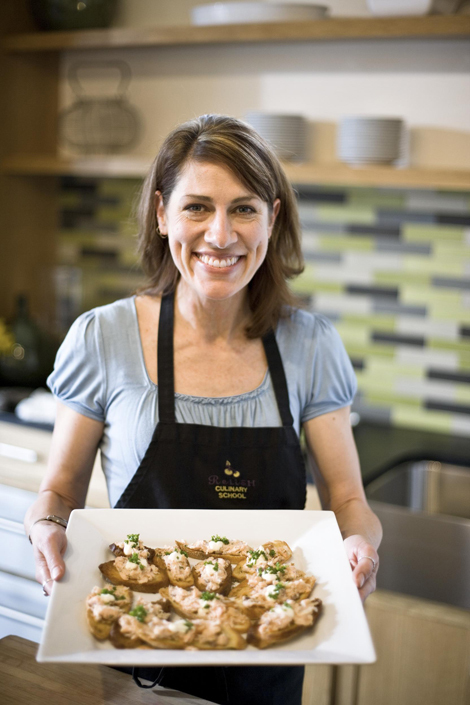 In her cooking school, there is particular emphasis on regional ingredients. "Classes combine chef, food, and location," she says. "Everyone experiences this convergence." Chef Greenwald guides Bill Garwin and the hors d'oeuvres team in preparing sourdough croutons for the Smoked Salmon Rillettes. 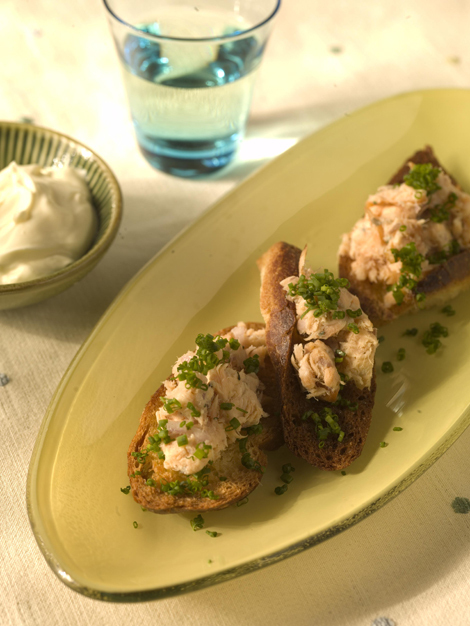 Recipe for Smoke Salmon Rillettes with Sourdough Croutons here. Kim Krueger proudly presents the Smoked Salmon Rillettes she topped with a dab of crème fraîche and a sprinkle of parsley. Laura Mack trims asparagus before grilling. Recipe for Grilled Asparagus with Spring Garlic Aioli here. 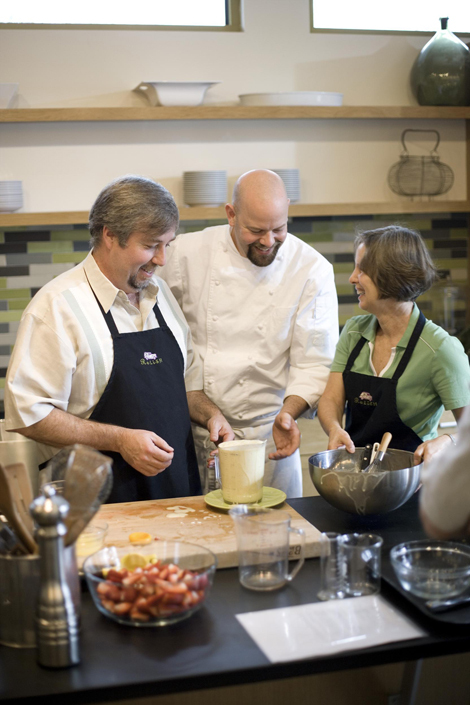 Jim Morris and Jan Garwin check the Meyer Lemon Panna Cotta mixture with Chef Greenwald. 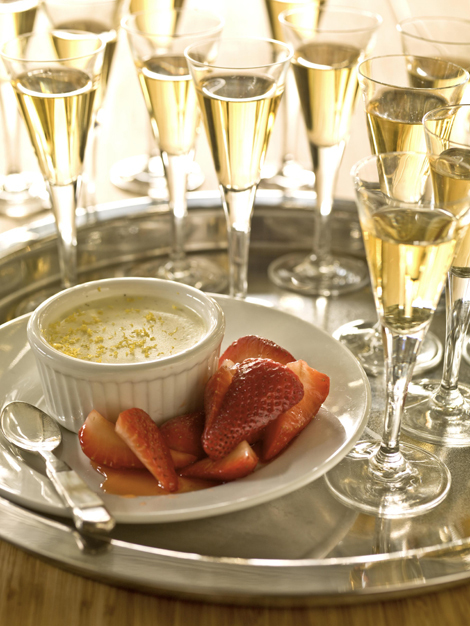 Recipe for Meyer Lemon Panna Cotta here. J Wine Sparkling Wines These creamy sparklers show subtle notes of citrus and almond (jwine.com). La Crema Pinot Noir Black cherries, floral notes, and nuances of clove and licorice typify these cool-climate pinots (lacrema.com). Quivira Grenache These biodynamically grown wines are light and versatile with a lovely nose of spice, earth, and fruit (quivirawine.com). Hanna Sauvignon Blanc Crisp, acidic, grassy flavors with a zingy finish (hannawinery.com). Longboard Late Harvest Semillon This luscious dessert wine has complex layers of fig, kiwi, peaches, and plum (longboardvineyards.com). Relish Culinary Adventures is located at 14 Matheson Street, Healdsburg, California 95448 (707/431-9999). 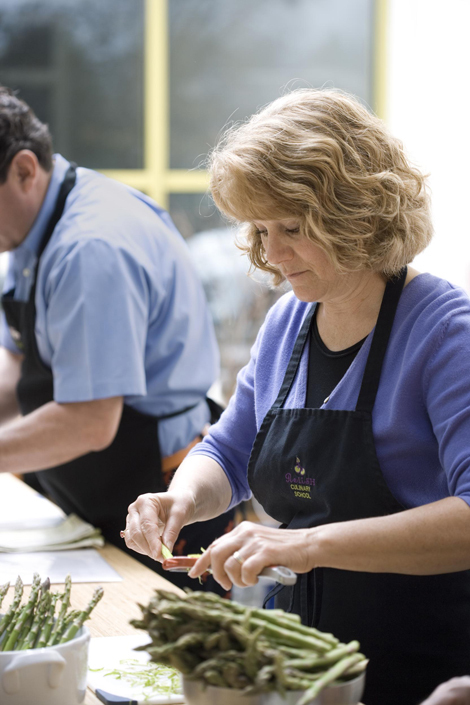 For a complete listing of classes and costs, visit relishculinary.com. 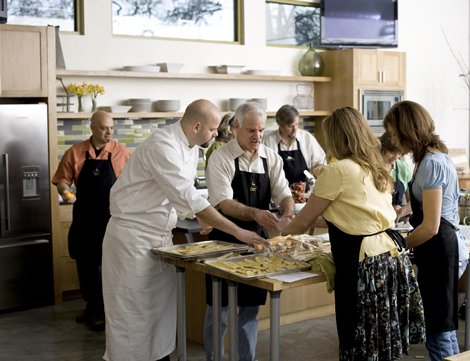 To join Traditional Home for an exclusive series of events in Healdsburg, including a class at the Relish Culinary Center, see the next slide. Traditional Home readers are invited to enjoy an exclusive opportunity to explore Healdsburg during the most exciting time of the year-harvest season. We'll gather on Wednesday, September 9, for a Winemaker's Dinner at one of Donna's favorite eateries, where we'll sample local wines paired with a four-course dinner. Thursday, take a Taste of Sonoma cooking class at the Relish Culinary Center featuring the best of the harvest season with Chef Christopher Greenwald and an assist from Traditional Home contributing food editor Stephen Exel. We'll break for lunch at Charlie Palmer's Dry Creek Kitchen, then tour a winery to experience the wine crush firsthand as Winemakers for a Day. Plan a few days on your own to explore Healdsburg and the Sonoma Wine Country. Class size is limited and available on a first-come, first-served basis. 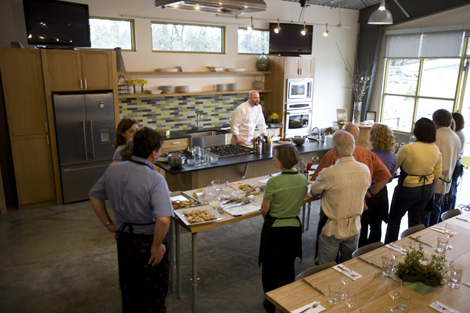 Cost is $450 and includes Winemaker's Dinner, cooking class, lunch, and winery program. To register, call Relish at 877/759-1004 or e-mail registration@relishculinary.com. Traditional Home has reserved a limited number of rooms at two hotels. The Hotel Healdsburg (hotelhealdsburg.com; 800/889-7188) defines modern luxury. The Vintner's Inn (vintnersinn.com; 800/421-2584) is a four-diamond hotel in nearby Santa Rosa. Rates vary; mention Traditional Home when you reserve. For other accommodations, contact the Healdsburg Lodging Coalition (healdsburglodging.com). 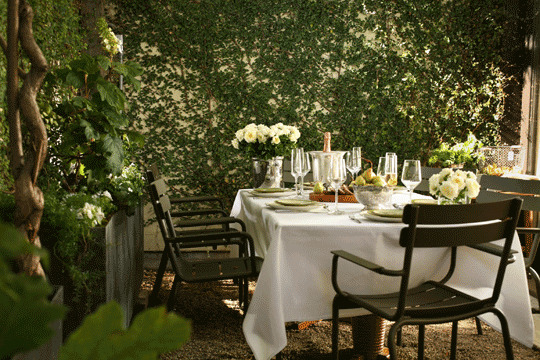 Dine in Healdsburg and discover what California dreamin’ is all about. Cyrus (707/433-3311), where Chef Douglas Keane was recently nominated for the James Beard award as Best Chef/Pacific, coddles with elegant surroundings and refined food and service. 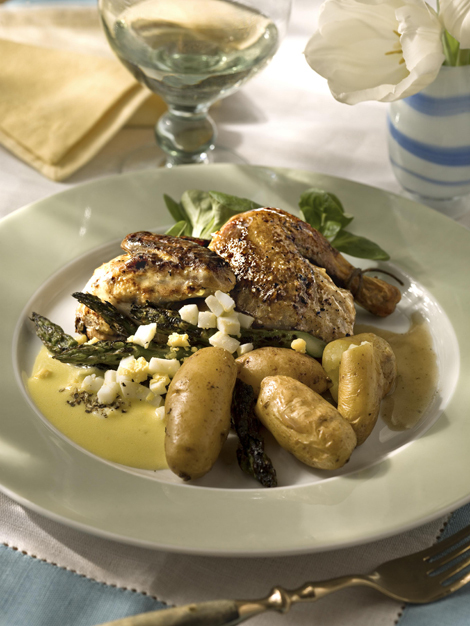 Barndiva (707/431-0100) uses only sustainable sources for their heartier fare. Locals love the martinis and eclectic menu at Bistro Ralph (707/433-1380) and the homey Italian cooking at Scopa (707/433-5282). Don’t miss the ethereal fruit galettes at Downtown Bakery and Creamery (707/431-2719). Healdsburg features local vineyard tasting rooms including Kendall-Jackson (337 Healdsburg Avenue) and La Crema (235 Healdsburg Avenue). Go to healdsburg.com for a complete listing of area wineries. For a broader scope, visit the Wine Road Northern Sonoma County site (wineroad.com), which represents 140 wineries and 50 lodgings in Russian River, Alexander Valley, and Dry Creek Valley. Hot-smoked salmon is thoroughly cooked by smoking it for 6 to 8 hours in an enclosure heated by fire. It can be used in most of the same preparations as cold-smoked salmon. Rinse chicken body cavities or chicken breast halves. Pat dry with paper towels; set aside. In small bowl combine softened butter, 1 tablespoon black pepper, and 1 to 2 teaspoons sea salt. Rub butter mixture onto chickens or chicken breast halves and under chicken skin, if possible. Tie legs to tail. Twist wing tips under back. Squeeze lemon over chickens. Set chickens aside. Preheat oven to 400°F. Heat 1 tablespoon olive oil in roasting pan over medium-high heat. Add chickens to hot oil in roasting pan; cook on all sides until golden brown, about 10 minutes. Remove roasting pan from heat. Make sure chickens are on their backs (or bone-side down for chicken breast halves) in roasting pan. In medium bowl, toss potatoes with remaining 1 tablespoon olive oil and remaining 1 teaspoon sea salt. Add potatoes to roasting pan with chickens. Place roasting pan in oven. Roast, uncovered, about 30 minutes or until chickens are no longer pink (165°F). Meanwhile, toss together the mâche, 1 tablespoon extra-virgin olive oil, and red wine vinegar. Season to taste with salt and pepper. Cut chickens in half and serve with potatoes and salad. Makes 4 servings. Chef Greenwald prefers fresh aioli, but for a quick substitute combine 3/4 cup mayonnaise; 1 bulb spring garlic, finely chopped; and 1 to 2 tablespoons lemon juice. Season to taste with sea salt and pepper. Wash asparagus; break off woody bases where spears snap easily. If desired, scrape off scales. Leave spears whole. 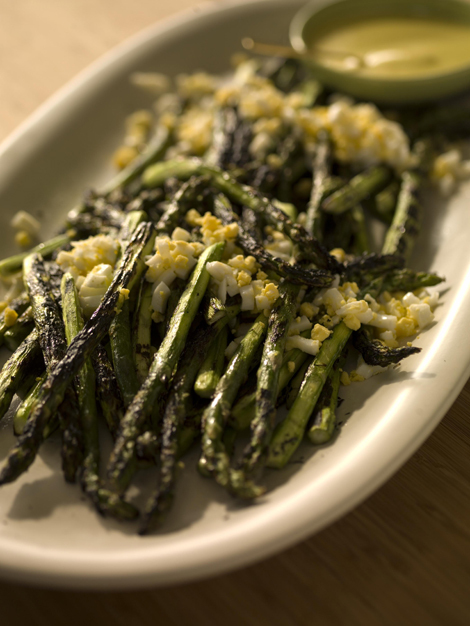 Toss asparagus with 1 tablespoon oil and 1 teaspoon sea salt; set aside. Finely chop spring garlic; place in large bowl with lemon juice and pinch of salt. Add egg yolk. Whisk vigorously until mixture thickens and becomes pale in color. Add oil in a thin, steady stream until aioli forms (should look like mayonnaise). Season to taste. For charcoal grill, lay asparagus spears across grids directly over hot coals. Turn frequently to cook evenly. Grill 3 to 5 minutes or until tender. (For gas grill, preheat grill. Place asparagus spears across grid directly over heat. Cover; grill as above.) Serve with aioli. Garnish with egg shreds. Makes 4 servings. * If spring onions are unavailable, you may use 1 finely chopped small green onion and 3 cloves of garlic, minced instead. ** If pasteurized eggs are unavailable, you may use regular eggs, however some experts believe raw eggs may be harmful to some people because of possible salmonella contamination. Squeeze enough juice from lemons to equal 1/4 cup; reserve 1 lemon rind. In medium saucepan combine 2 cups cream, the vanilla bean pod, the reserved lemon rind, and the 1/2 cup sugar. Heat over medium-low heat until mixture comes to a simmer, stirring occasionally to dissolve sugar. Remove from heat; let stand 10 minutes. Meanwhile, place remaining 3/4 cup cream in small bowl; sprinkle with gelatin. Let stand 5 minutes for gelatin to soften. Stir softened gelatin into saucepan; return to medium heat and cook until gelatin is dissolved. Stir in the 1/4 cup lemon juice. Strain to remove vanilla bean pod and lemon rind. Scrape the vanilla beans from pod. Stir vanilla beans into gelatin mixture. Divide among four 10-ounce or six 6-ounce custard cups. Cover; chill at least 4 hours or until set. In medium bowl combine strawberries and 2 tablespoons sugar; let stand at least 5 minutes, stirring twice. 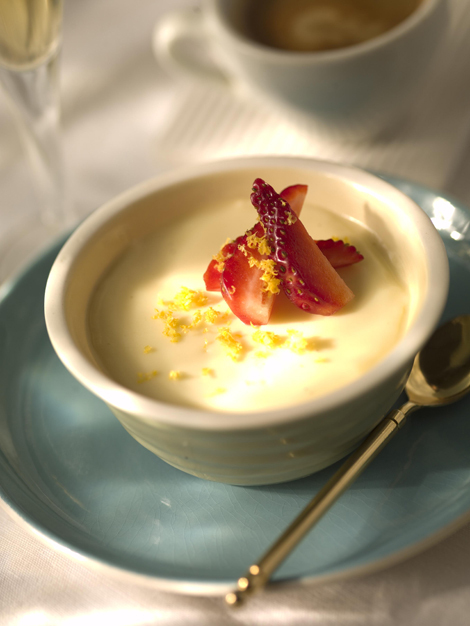 Serve in custard cups topped with strawberries or dip bottoms of custard cups into hot water for 10 seconds and loosen sides. Unmold onto dessert plates; serve with strawberries. Makes 4 to 6 servings.